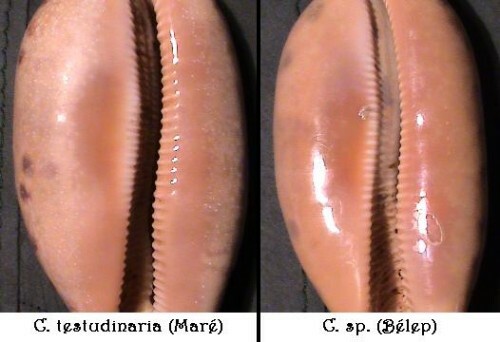 Home › Articles › Online Articles › A new Cypraea testudinaria from northern New-Caledonia ? The Chelycypraea group (one species, C. testudinaria) can clearly be linked with the Trona group (one species, C. stercoraria), for instance, thanks to some features of the shell. Amongst those features, one may notice the strange shape of the fossula which is almost similar in both group. Back in 2000, I found, during my stay in New-Caledonia, an interesting shell which I thought to be an ordinary C. testudinaria (Bélep Islets, Northern N-C). However, apart from its huge height (131mm), I noticed that the fossula had a strange shape for a C. testudinaria. This is of course the most striking feature. After a close inspection, other singularities may be checked. This specimen was compared with a C. testudinaria coming from Maré ( Loyalties Islands, East N-C). It measures 125 mm. You can notice that both columellar and labral sides of the anterior extremity are different from the «normal» shell. On the columellar side, you can easily see that the extremity is far narrower and this feature induces a modified disposition of the last teeth (see the position of the terminal ridge). On the labral side, the extremity is projecting slightly more than on the normal shell. The modified anterior extremity induces a slight modification of the fossula peristome. Another interesting feature is the position of the spire on the shell. Indeed, the position of the protoconch (extremity of the spire) is higher in relation to the posterior extremity. So, only ¼ of the spire is covered by the developped callosity of the extremity instead of at least ½, on the normal shell. Here are the differences I noticed on the shell. I believe this cowrie to be a new sub species or species. It comes from Bélep Islets (where shelling is a bit hard those days because of the hard social context), New-Caledonia. Your advice and remarks on this article are of course welcomed.